Our brand new Beach Bum Gnome - Solar Snorkeling edition reminds us of the magic and allure of adventuring in the sea. He brings light in the dark and wonder in the daytime. Equipped with black fins and matching mask and snorkel, colorful green kelp envelopes him as he grasps that perfect milky white shell for his collection. 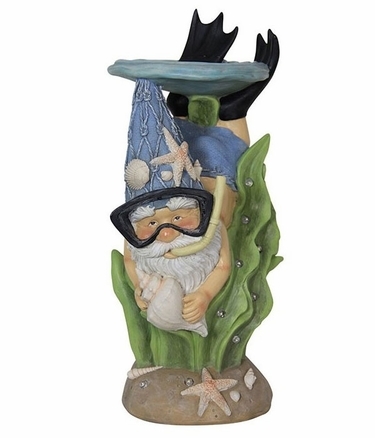 So embrace summer with a Snorkeling Beach Bum Gnome today. We know you will agree that he is the perfect addition to any garden, deck or beach house. Size: 9" x 8" x 19"H, Resin & Solar.